Supply chain sources from the Far East indicated to DigiTimes that Apple has "adopted even stricter management over its supply chain than before," a report published on Monday reveals. The changes include more frequent inspections, greater time spent on inspections, and a renewed focus on managing costs and product quality. All of Apple's suppliers are being "heavily evaluated," the report said, as Apple has placed particular focus on the performance of its supply chain over the last six months. In one example, Apple reportedly discovered a fingerprint mistakenly printed on one internal component from Apple's latest MacBook lineup. Upon discovering the error, the company allegedly demanded a recheck of its entire production line to resolve the issue. Apple's new, stricter approach is said to be a "challenge" for production line management at suppliers. Monday's report also said that it is expected to set a new threshold for companies that might attempt to enter into Apple's supply chain. Cook's ability to ensure Apple's supply chain runs smoothly and efficiently was known as one of his hallmarks well before he took over as CEO of Apple full-time last August. Apple co-founder Steve Jobs originally brought in Cook to make the supply chain leaner and more agile, with limited overstock of inventory. When Cook initially took over Apple's supply chain, he cut down the number of component suppliers from 100 to 24, forcing companies to compete for Apple's business. He also shut down 10 of the 19 Apple warehouses to limit overstocking, and by September of 1998 inventory was down from a month to only six days. 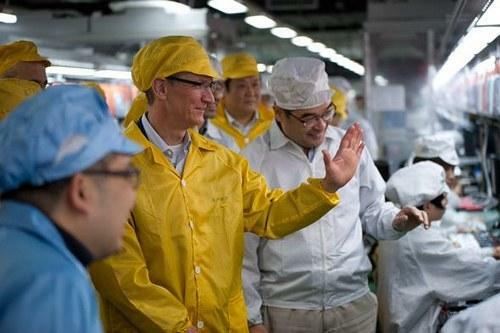 Earlier this year, Cook even personally visited an iPhone production plant in Zhengzhou, China, run by Foxconn. The trip came as Apple faced media scrutiny over working conditions in its overseas supply chain.